Not to toot my own horn or anything, but sometimes I really do step it up in the mothering department. Sure most of the time I'm pretty much phoning it in, but once and awhile I manage to come up with an activity that both occupies the Muffin Man and is not mind-numbingly boring for me. Case in point: last week we made pumpkin muffins together. He had a great time, the baked goods were delicious, and it occupied an hour of our day during that period of the afternoon when I usually find myself counting the minutes before wine o'clock. It turns out that Noah is skilled with a whisk. All I can hope is that this doesn't foreshadow his wanting to pursue a dead-end career in the restaurant business. Shudder. These are some of the best gluten free, dairy free, sugar free muffins that I've ever made. They keep at room temperature for 3-4 days, and they are moist and crumbly just like a normal muffin. The Muffin Man himself couldn't get enough of them! 1. Preheat oven to 350 degrees. Position rack in center of oven. Have your kiddo line a muffin tin with baking cups. 2. Mix flour, coconut sugar, baking soda, salt, baking powder, cinnamon, nutmeg, ginger, and cloves together in the bowl of an electric mixer. 3. Combine eggs, milk, oil, yakon or molasses, and pumpkin in a separate bowl. 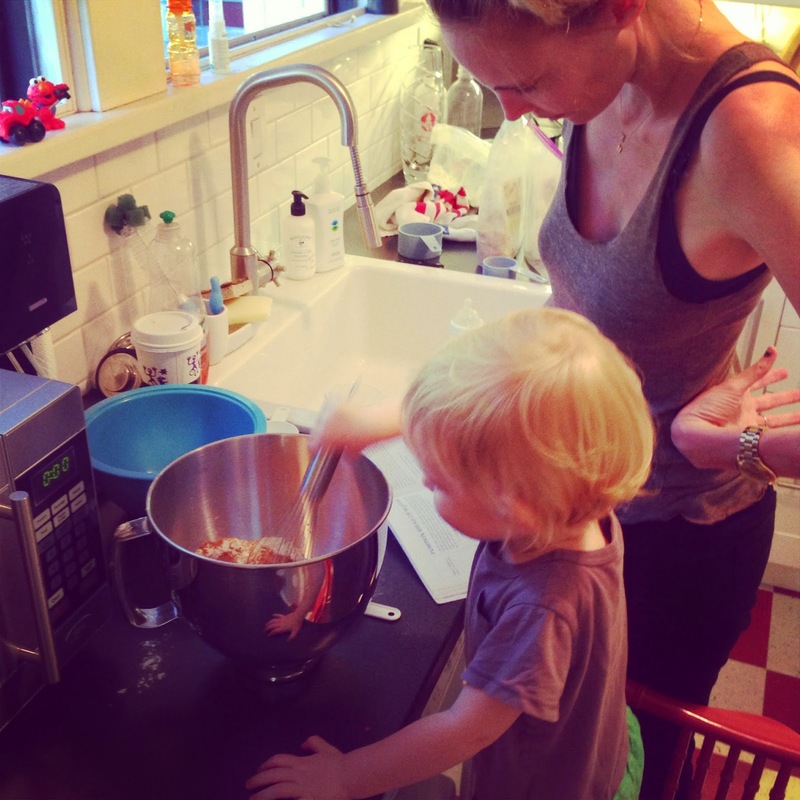 Hand your toddler a whisk and put him to good use mixing up the wet ingredients. 4. Pour the wet ingredients into the dry and mix until well-blended. Do not over-beat. 5. 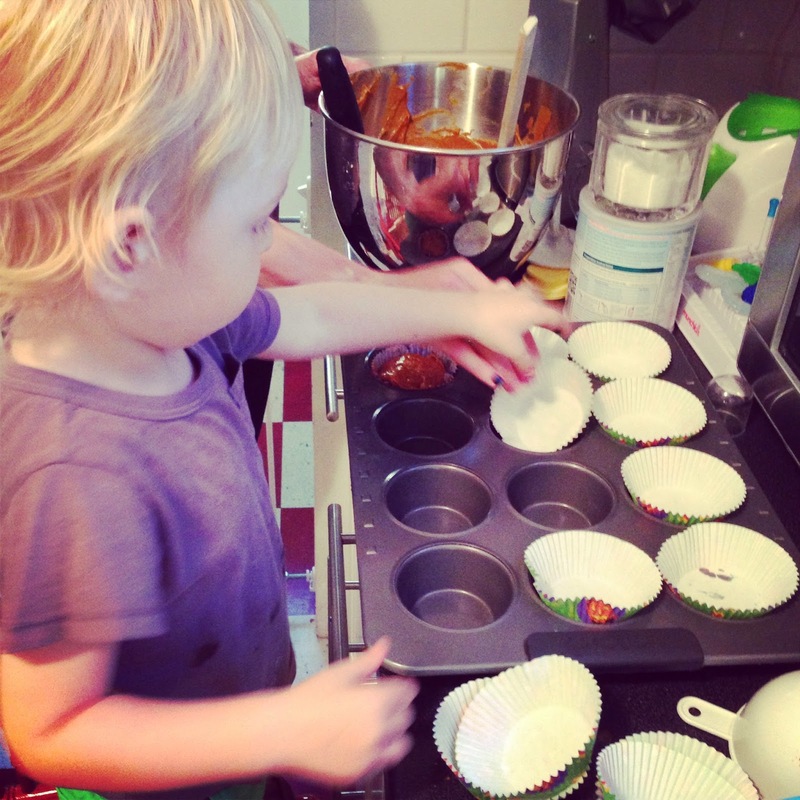 Hand your little one an ice cream scoop and have him help you evenly fill each muffin cup. Yes, this will probably get messy. 6. Bake about 18-22 minutes or until toothpick inserted into the center comes out clean. 7. Remove muffins from pan immediately and allow to cool on a baking rack.